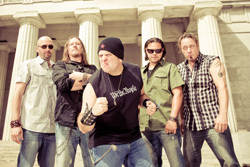 Resurrected from their demise better than 20 years in the underground metal scene is New York's Coldsteel. Back in the day they had a good reputation for creating classic American thrash. They had some demos, even a long player, Freakboy, but as things go their history has more twists and turns than a daytime soap opera. 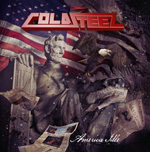 But Coldsteel's back with a five song EP, American Idle, and they're not straying too far from their Eighties thrash metal roots. This is definitely for fans of early Metallica, Slayer, Anthrax, Megadeth, or Overkill. There's lots of speed and intensity, strong bass and drum work, lots of slick riffage, some big guitar solos, and decent, sometimes raspy, always clean vocals, all wrapped up in melodic metal. Actually, having only been reorganized since 2012, it's surprising how good Coldsteel and American Idle sounds. While not necessarily an overly technical album (it's rather straight forward American thrash), the arrangements are quite sophisticated, keeping your attention and interest. It seems Coldsteel put some time and thought into this production. After all they could have rehashed some of their older stuff. Here's hoping that American Idle takes off; if Coldsteel had promise 20 years ago, then they've lost none of that promise and power today. Recommended. Here's hoping that American Idle takes off; if Coldsteel had promise 20 years ago, then they've lost none of that promise and power today. Recommended.